Published under the pseudonym Captain Charles Johnson, this book was attributed to Defoe in the 1930s by a leading scholar of his works based on an analysis of its style and moral teachings. Defoe’s authorship was challenged in the 1980s, with Nathaniel Mist being proposed as an alternative author in 2004. Mist was an associate of Defoe’s who had been a sailor in the West Indies before returning to England, where he worked as a writer and journalist. Mist had previously covered pirates in his publication The Weekly Journal and wrote several articles praising this book after its release. One potential reason for the book’s anonymous publication was Mist’s association with the Jacobite political movement, for which he had recently been imprisoned. On display are a 1742 edition and a 1999 scholarly edition of the original 1724 text. This work helped to popularize many of today’s now commonplace pirate tropes like the Jolly Roger flag and peg legs, and immortalized famous pirates like Edward "Ned" Low and Edward Teach, better known as Blackbeard. Daniel Defoe (1661?-1731)? or Nathaniel Mist ( -1737)?. 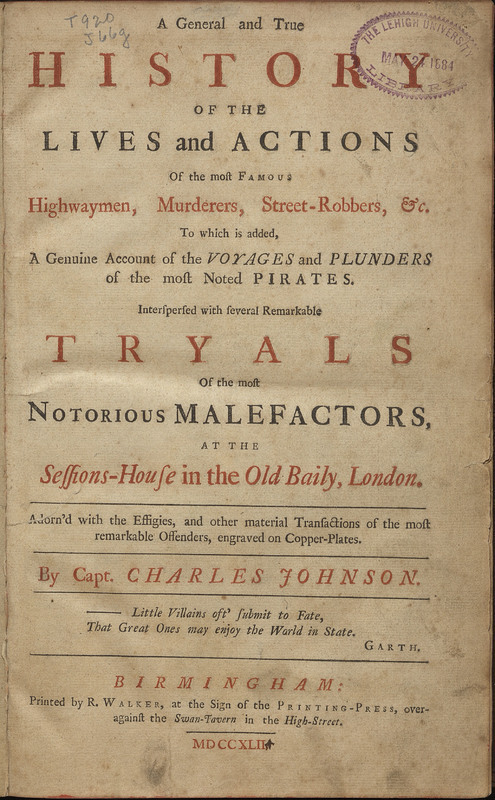 A General and True History of the Lives and Actions of the Most Famous Highwaymen, Murderers, Street-robbers, &c.: To which is Added, a Genuine Account of the Voyages and Plunders of the Most Noted Pirates. Birmingham: R. Walker ..., 1742. A version of this text has been digitized and is available through Lehigh University's Digital Library. _. 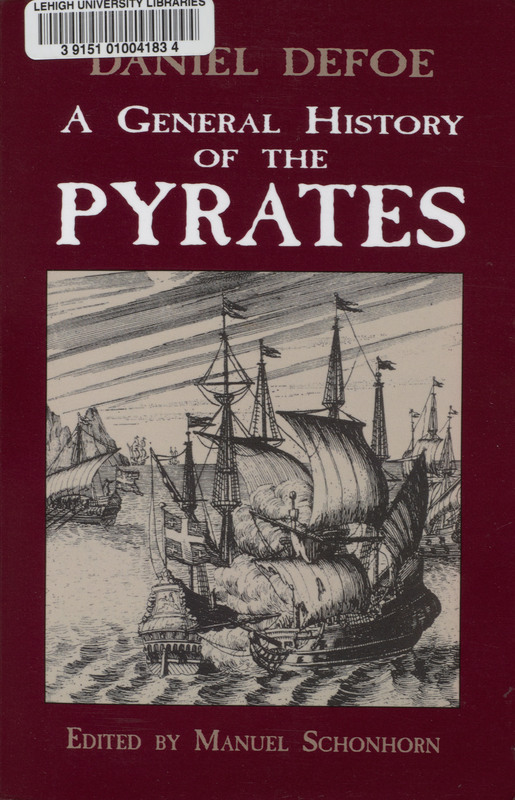 A General History of the Pyrates. Mineola, N.Y.: Dover Publications, 1999.